I've found that when if comes to having successful playtime with the boys (and the Man), it is important not to set them up for failure. 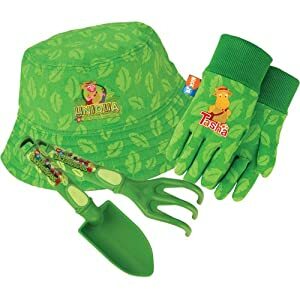 In the realm of gardening, this means supplying them with the proper tools and gear. For instance, the picture on the left shows the Man-child with the Man's shovel. It is clearly too heavy, and he was whining. The picture on the right shows him with a more size-appropriate tool. Purchasing kids' tools isn't necessary. Inevitably, whatever tool you are using is eventually going to be the one they demand. 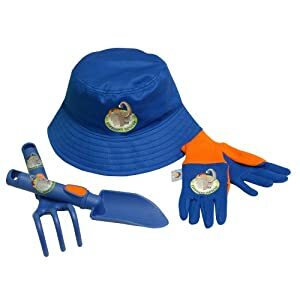 However, garden centers do make great plastic hand tools that are less likely to cause damage in the case they are used to bop another kid on the head or make their way indoors. 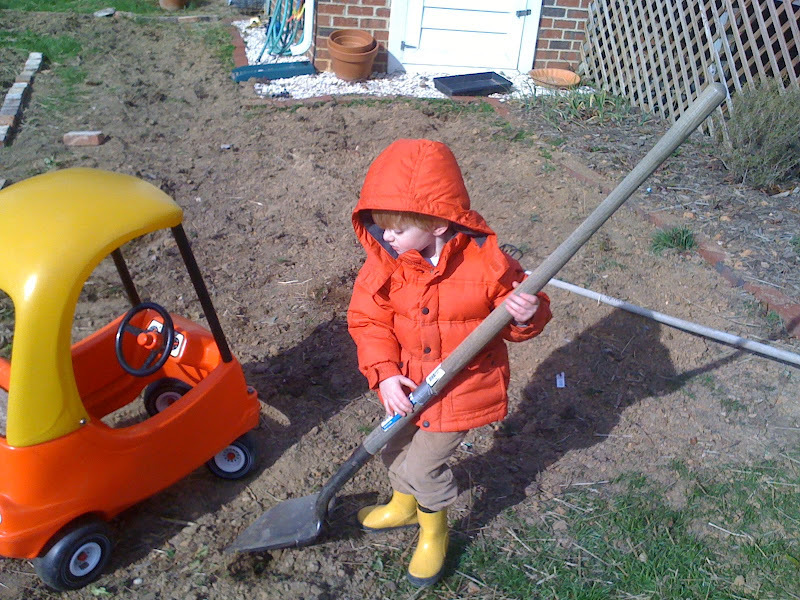 When I can keep it all together, I store the shovel and rake in a bucket that can also be taken to the playground. 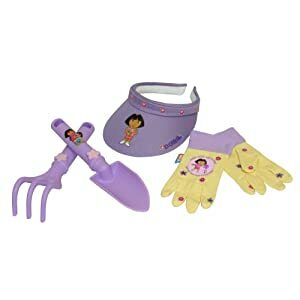 These are cute sets I found on Amazon by Midwest Quality Gloves. Similar styles are usually available at Lowes in the glove and tool section. I purchased a shovel and rake with matching bucket on wheels (sans cartoon characters) at Walmart several years back. Personally, I like having kid tools and adult tools because it helps teach responsibility and my own tools are less likely to go missing. We also make sure that the Man-child's feet are well protected. 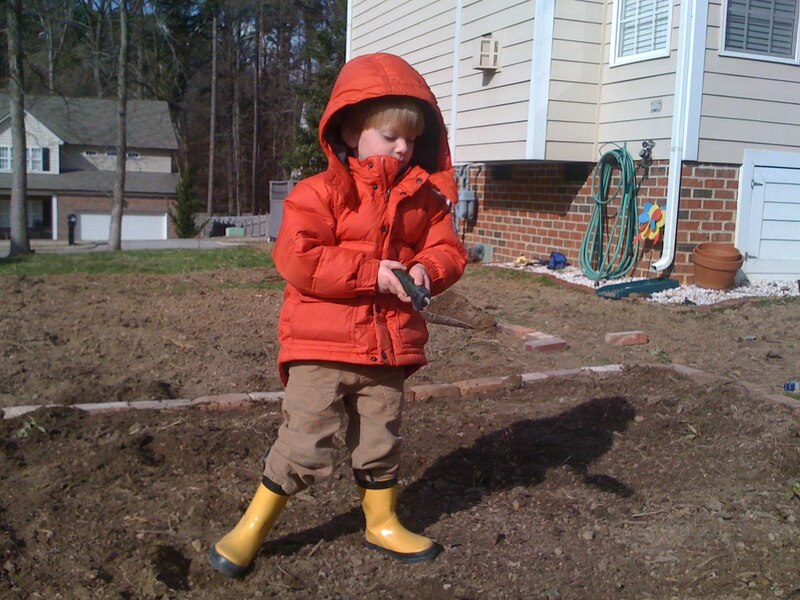 There have been several encounters with fire ants, so now we have him wear close-toed shoes in the garden. It definitely puts a damper on running barefoot and free, but if you have a fun pair of work boots like his cheery yellow galoshes from Old Navy, you may not get too many protests. The moment we get into a house, this is the first fun thing I want to buy: a set of gardening tools for Autumn. I've never been able to share a garden with her, since she was just too little when we were in Raleigh. I'm so excited to prepare her for the fun! I can't wait to see pics of her all decked out and helping!